PRESS RELEASE: Alesis, a leading manufacturer of professional audio equipment and studio electronics, announces the DM10 electronic drum set and DM10 drum sound module. Alesis will unveil the DM10 Studio Kit and introduce the DM10 at the 2010 Winter NAMM Show in Anaheim, CA, booth 6400, January 14-17. The DM10 Studio Kit builds on the successful DM10 Pro Kit, bringing its incredible sounds, natural feel and customizability to even more drummers. Based around the critically acclaimed DM10 drum module, the DM10 Studio Kit features Alesis' RealHead drum pads, DMPad Cymbals and StealthRack mounting system. The DM10 sound module builds on Alesis' tradition of highly professional, great-sounding drum modules. The DM10 features an extensive factory sound set with breathtakingly natural sounds and the ability to load entirely new sound sets via USB from a Mac or PC. Drummers will immediately notice the DM10 module's outstanding sound quality. This new drum sound module contains true drum, cymbal and percussion sounds built from uncompressed samples of classic studio drums and prized cymbals. Drummers will find some of the most in-demand acoustic drum sounds from legendary drum brands, a huge arsenal of top producers' go-to snare drums, real American, Canadian, Chinese, and Turkish cymbals, and electronic beat-machine sounds that have fueled the biggest hit records. Discerning drummers will notice that each sound is actually a series of different samples: multiple dynamic-level samples and articulations are all built in so as the drummer plays harder and softer, the drum or cymbal changes its timbre, not just its dynamics. This engineered realism is known as Dynamic Articulation, an Alesis exclusive. Drummers can play with or without reverb for different room sounds and enjoy a wide variety of rimshots, rim clicks and different stick-placement sounds on the cymbals. For example, a hi-hat's sound depends on a number of factors: how open or closed the pedal is, how hard it is struck, and other variables resulting in 40 different sounds - plus foot chick and heel splash. The DM10 module not only has a breathtaking collection of sounds on board, it is also the world's first drum module that enables players to load new sound sets via USB. This means that owners' sounds will always stay fresh, current and cutting edge. Drummers can also use the DM10 as a trigger-to-MIDI interface for performing and tracking with software drum modules such as BFD, Toontrack and Reason. Drummers can play along with the tracks in the DM10's internal sequencer. They can mix in an iPod or other MP3 player and jam. The DM10 module has 12 inputs, 10 of which are dual-zone compatible or can be split into two inputs using a standard Y-cable. This enables DM10 drummers to create custom configurations with up to 22 single-zone triggers or pads. The DM10 works with virtually all manufacturers' pads and triggers, and its input section can be further expanded with the optional Trigger|iO module. The DM10's top-panel mixer allows drummers to easily create custom mixes without having to page through menus of parameters to achieve volume changes. These hands-on faders apply globally so as the drummer changes kits, the mix remains. The DM10 Studio Kit has acoustic-feeling RealHead drum pads. The dual-zone pads feature real mylar drumheads and real triple-flanged counterhoops for the feel professional drummers demand. The ten-inch snare and four eight-inch tom pads are dual zone, enabling players to perform rimshots, rim clicks or assign other sounds such as wind chimes, cymbals, gongs and cowbells on the tom rims. The DM10 Studio Kit comes with DMPad Cymbals with low-noise rubber playing surfaces. The kit comes with a DMPad 12" Hi-Hat Cymbal, two DMPad 12" Crash Cymbals, and a triple-zone DMPad 14" Ride Cymbal. The Ride and one Crash feature large choke strips on the undersides for accurate cymbal control. The Ride also features multiple-zone triggering on the bell, face and edge. The Hi-Hat Cymbal is continuously controllable using the included RealHat Pedal. The DM10 Studio Kit's ergonomically curved StealthRack features a small footprint and understated appearance that is perfect for studios. The aluminum StealthRack is fully adjustable and sturdy. It employs standard one and one-half-inch tubing for compatibility with virtually all drum manufacturers' rack hardware. Drummer-friendly wing-screws are present on all important rack clamps and pads for ease of adjustment without reaching for a drum key. The drum pads mount on standard 10.5mm L-rods with low-slip, knurled mounting surfaces. "The DM10 is a huge step forward for drummers," said Jim Norman, Product Manager, Alesis. "Never before has there been a drum module with this degree of realism and limitless expansion. The DM10 Studio Kit brings the DM10 module to a whole new audience. With this new six-piece setup, you can really get creative with multi-tom fills!" 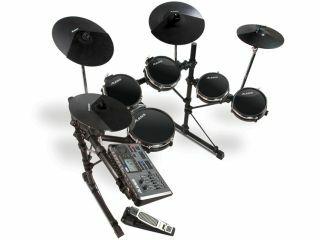 The DM10 Studio Kit will be available from musical instrument and professional audio retailers in February 2010.